I was going to get in the best physical condition of my adulthood. I was going to maybe find a girlfriend. Fail, fail, and more fail. I wrote a third of a book. I worked out every day for a stretch and was feeling good and then let the holidays totally derail my efforts instead of maintaining a disciplined routine. I continued to be shy and cowardly out in the world and never met anyone I could realistically have a long-term relationship with for one reason or another. It does make me a failure. But it doesn’t make me weird. About 92 out of 100 people failed to meet their New Year’s resolution goals in 2014. That paltry 8% success rate is expected to continue in 2015. Do you want to be the kind of person who fails to achieve their goals but takes solace in being a member of the overwhelming majority? Or would you prefer to be a better version of yourself? The kind of person who says or aspires to do something, and then goes out, follows through, and does it? A hundred years ago, nobody brushed their teeth every day like most of us do now in the United States. Claude Hopkins was among the first admen to figure out that marketing isn’t all art. There’s a science component, too. One of his old business colleagues invented a toothpaste called Pepsodent. The friend asked Hopkins to build a national ad campaign for the product. Selling toothpaste in the early 20th century was financial suicide. No one brushed their teeth. It was like trying to sell snow skis in Florida, or live fishing bait in the middle of the Sahara. Despite the enormous challenge, Pepsodent was one of the best-known products on earth five years later and more than half of all Americans had begun brushing their teeth daily after a lifetime of never doing so. Hopkins defined a problem and provided a solution. He identified one of the most-important, most-overlooked phenomena in the human experience: The habit loop. That’s it. That’s the habit loop. The cue? A dirty, smelly mouth with slimy, filmy teeth. The routine (or solution)? Daily brushing with Pepsodent! The reward? A clean, fresh mouth, with white, beautiful teeth that made you look better than other people. I’m reading a fantastic book called The Power of Habit: Why We Do What We Do in Life and Business by Charles Duhigg. I picked it up on a whim at an airport during my holiday travels. The book explores the reasons why human beings do what we do. And it explains how habits guide so much of our behavior, effectively eliminating decision making from much of our daily activity. It explains why you smoke and drink and exercise (or don’t exercise). It explains why Cinnabon stores are rarely located by other food vendors, why people with severe memory loss who can’t recognize their home can learn to walk around the block and find their way back, and why Alcoholics Anonymous has had so much success through the years helping people change unhealthy behavior. In some respects, they’re unstoppable. The cue happens. And your brain requires the expected reward. To achieve that reward, you will automatically turn to things that you know give you the reward. Smokers smoke. Alcoholics and addicts will drink or get a fix. Others will eat unhealthy foods or indulge in sexual urges or bite fingernails or whatever. The key to stopping those unhealthy choices is to recognize what triggers the urges. 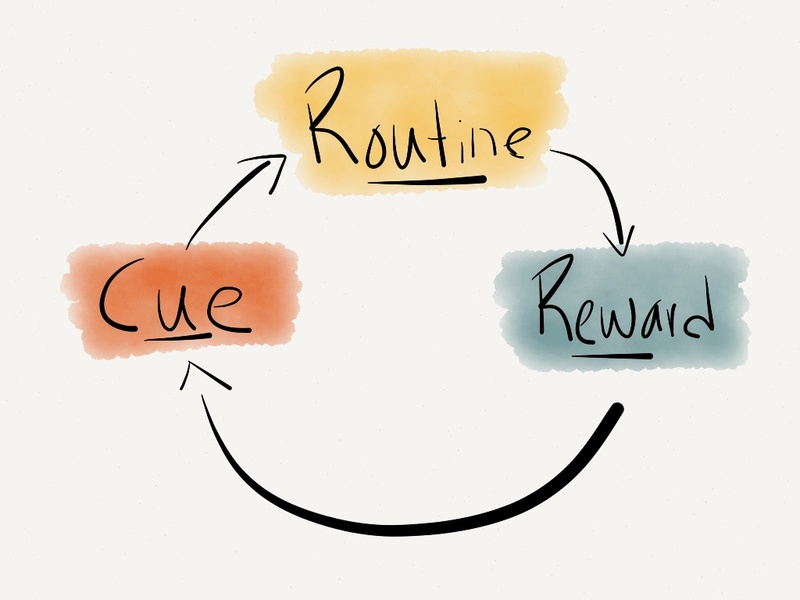 And if you’re mindful of the cue, your next task is to figure out an alternative to achieve that same reward. Maybe it’s caffeine instead of nicotine. Maybe it’s a therapeutic conversation with a sponsor instead of a drink. It almost doesn’t matter so long as one understands there is always a trigger and always a reward the brain and body craves. The only thing that needs to be changed is the routine. And then we replace the bad with the good. Once you do something enough times? It becomes automatic. Thoughtless. Easy. I didn’t make a New Year’s resolution even though researchers at the University of Scranton say people who explicitly make resolutions are 10 times more likely to attain their goals than people who don’t make them in the Journal of Clinical Psychology. But I also don’t like being cliché. I didn’t successfully quit smoking years ago because of a New Year’s resolution. I quit smoking because I didn’t want to die young and because I didn’t want my young son to believe smoking was okay based on what he observed his father doing. But I don’t need the turn of the calendar to make positive changes because there are no advantages to waiting. I can start today. Right now, even. I can work to stop biting my nails. I can develop new time-management habits that would allow me to finish the book. I can find new ways to engage my son and be a better father. I can insert myself in new environments and situations that will allow me to meet more people and make more friends. I can exercise longer and harder and more frequently. I can be more grateful. I can ask better questions. I can be quicker to apologize and forgive. I can be more mindful of today and tell people I love how much I appreciate them while they’re still here to tell. The hunger and cravings are there. The rewards are felt when I indulge them. But the routines fall short. And I don’t have to wait until later to do something about it. Be gentle with yourself. Just pick your self up and try all over again. It isn’t a failure, just a slight diversion and learning experience. Thank you, Leslie. I suspect 2015 will be filled with many successes. I have much to look forward to. You do indeed. Just keep that sense of adventure. Ahh, what a lovely post. Fascinating about the toothpaste! You’ve really captured the essence of all my life issues. I flit from one reward center of my brain to the next, fortunately only in mildly inconvenient ways, but those habits are a real bugger to try and break. I’ll have to ponder attempting to replace them with something better instead. I do know that resistance is futile, but perhaps there’s a way out after all. Of all the things I’ve read in the past week or so, this one made me smile the most and feel the best. I think so much about trying to stop bad habits, and I think so little about developing good ones. But it’s really not that hard. It’s a matter of being dedicated to the repetition of whatever the thing is. And once that becomes ingrained? It’s almost like you can’t NOT do the good thing. Seems wise to incorporate as many of those good things as possible. Thank you for for reading and leaving this note. Great post. I couldn’t agree more on the habit making. It’s the only way I ever achieve anything in exercise. I watched a speech today about how important drive is rather than talent, to achievement. Making things habit does involve some push/drive but with the right attitude you can do it. Thank you very much. One-third talent, two-thirds effort? I think that’s probably close. I very much appreciate you reading, commenting, and sharing your work. It’s the same story here. Thank you very much for sharing this. Hope you’re having a very happy New Year. My routines are what kill me sometimes. Like you said, we can all do so much more: I can read more and exercise more and write more and speak up more when I see something that doesn’t sit well with me. I can physically do those things, but the fear of upsetting the routines of ambivalence and complacency that I’m accustomed to is often the biggest obstable in my way. I just hate fear so much. When I was a newspaper reporter, someone I was interviewing talked about what a powerful force inertia can be. It’s hard to get motionless things to move. But once you do? Look out, world. Great to hear from you, Emily. I hope you’re getting settled in after your big move, and that you and your family have had a lovely holiday season. YES. Inertia. In addition to a word I feel smart when I say, it is also a major biotch. Holy crapballs. I mean that in a good way. Damn. Humbled. Great post! I’m reading that book myself! Thank you! I’m so glad someone else knows about it. I’m fascinated. In the history of the known universe, no human has proven himself to be less competent at dating than I am. Perhaps I can muster up a post on the subject in the relative near future. If I do, I’ll make sure to notify you so you can feel better about your life! The most difficult habit to establish may be self-acceptance. For some reason, when you can accept who you are, sometimes you are then free to change. Don’t ask me why…I’ve seen it happen over and over again.